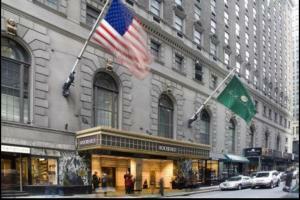 Situated near Park Avenue, this hotel is only 3 blocks from the New York Public Library. The Seton Hotel features free Wi-Fi and a cable TV in every accommodation. In addition to their standard rooms, Hotel Seton offers rooms featuring modern décor. All rooms include a work desk and a telephone. Mini refrigerators are available upon request. A 24-hour front desk and a safety deposit box are available for guest convenience. Times Square, the Empire State Building, and Grand Central Station are all within walking distance of the hotel. Columbia University is 8 km away. When would you like to stay at Seton Hotel ? Room features a flat-screen TV. Room decor varies from room to room. This room has a flat-screen TV and desk. Room decor varies from room to room. A private vanity is included in this room, which offers access to a shared bathroom in the hallway. Room decor varies from room to room. This room features a flat-screen TV and a private bathroom. Refrigerator are available upon request.Room decor varies from room to room. This room features an airy bathroom, a desk and a flat-screen TV. This suite features a sitting area with a sofa, a bathroom and a flat-screen TV. Guests are required to show a photo identification and credit card upon check-in. Please note that all Special Requests are subject to availability and additional charges may apply. Guests must be at least 21 years old to check-in. The name on the credit card must match the name on the reservation. If the names are different, a letter of authorisation must be provided. Each day we'll check prices and send you an email for your selected dates at Seton Hotel. If you don't have specific dates but would like to check prices for say next weekend or say next month we can check the price too. Click to write a review and share your experience of Seton Hotel with other travellers.